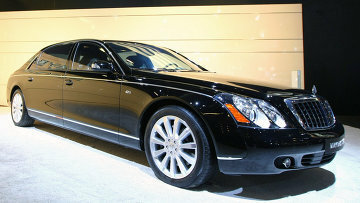 Maybach confiscated from unemployed Siberian debtor | Russian Legal Information Agency (RAPSI). NOVOSIBIRSK, October 16 (RAPSI) - Court bailiffs confiscated a Maybach 62 from an unemployed resident of a suburban development in the Russian Novosibirsk Region. The premium class German car was pledged by the bank, the regional branch of the Federal Court Bailiff Service reports on Thursday. The man who breached his loan agreement did not want to part with the expensive car until the issue was resolved in court. The court ruled that the pledged car must be confiscated as a debt repayment and that the debtor must also pay over 11 million rubles ($270,000). The man was aware of his huge debt and avoided court bailiffs in every possible way. Eventually, they visited his home and arrested the luxury car. The Maybach was towed away to a temporary parking lot. “Currently, the car industry masterpiece is awaiting evaluation for further sale. The money obtained from the purchase will be used to repay the debt,” the bailiffs said. Maybach is one of the most expensive production cars. New models start at over 10 million rubles ($245,000). In 2012, the brand was eliminated and Mercedes S-Klasse took over the status of Daimler’s flagship brand. 13:00 16/10/2014 Court bailiffs confiscated a Maybach 62 from an unemployed resident of a suburban development in the Novosibirsk Region. The premium class German car was pledged by the bank, the regional branch of the Federal Court Bailiff Service reports on Thursday.